But the use of technology in this sector faces many unique problems in the control of its systems, and central to this is the role of the flowmeter, which is used to co-ordinate operations. All of these functions have very different requirements with varying degrees of complexity and accuracy demanded of them. Whether it’s measuring specific amounts, batch tallying, or monitoring usage of a fluid, the aim of the control is always to achieve a consistency of product in greater yields with lower levels of wastage. All of this is further complicated by the wide-ranging properties that the fluids themselves possess. Of the many liquids that are used in the food industry, there is a huge amount of variety between production plants, due to the products that they’re making and hence the ingredients that they need to use. One key example of this can be seen in the viscosity levels of the fluids being monitored, which can differ enormously from solvents to thick syrups and dough mixtures. Further to this, there can potentially be solid compounds or entrained air contained within the fluid which causes a problem for some equipment, such as transit time ultrasonic flowmeters. Safe food handling is also closely linked to the control of the environmental temperature that the food is exposed to. While some ingredients will require cool temperatures to prevent increased growth of bacteria and decomposition, others may need to be maintained at high temperatures to either keep the food safe or in some cases, such as with chocolate, kept in a state that allows it to be manipulated as desired in the production process. Coupled with steam and high humidity, this can provide a challenging environment for some equipment to function unaffected. This leads us to the one over-riding consideration that is of paramount importance to the food industry. The most important aspect of equipment used within the food industry is that of hygiene. Any in-line devices must be hermetically sealed to prevent contamination and any moving parts need to be structurally robust and clean of lubricants and other substances, which could cause contamination of the passing fluid. This again adds an extra layer of difficulty into the monitoring of these liquids which remedies some standard equipment inappropriate for a specified task. Whatever devices or equipment is eventually chosen must also be evaluated in a HACCP analysis. One solution to this problem comes in the form of clamp-on equipment. Using equipment that is not directly in contact with the products negates the need for food-friendly materials and also greatly reduces the need for cleaning and maintenance of the equipment. For other pieces of equipment that must come into contact with the fluid, there is a growing number of choices becoming available on the market that is food safe, such as polytetrafluoroethylene (PTFE) or Teflon as it is commonly known. With many manufacturers and suppliers of flow metering devices now specializing in the food industry, it is possible to receive help and advice from them with regards to current legislative requirements within the industry. One of the largest and most common areas of flow control across all areas of food production is in water management, an area of businesses that can be of great financial cost. Similar to many other industries, food processing businesses require the usage and expulsion levels of water to be measured and recorded. One main reason for this is the charges are often placed upon businesses relative to the amount of waste they produce. Not only do they need to audit this to verify the charges, this also provides an opportunity to monitor and control the amount of wastage that the processing plant creates. Whilst regular equipment can and is used for processes such as the running of cooling systems in the factory, the waste management systems can operate to a lower level of accuracy than other processes as they’re not needed to deliver primary information in the overall operation. This allows the business to still provide a control through the use of open-channel flowmeters but at a reduced cost in comparison to other flow detection systems. 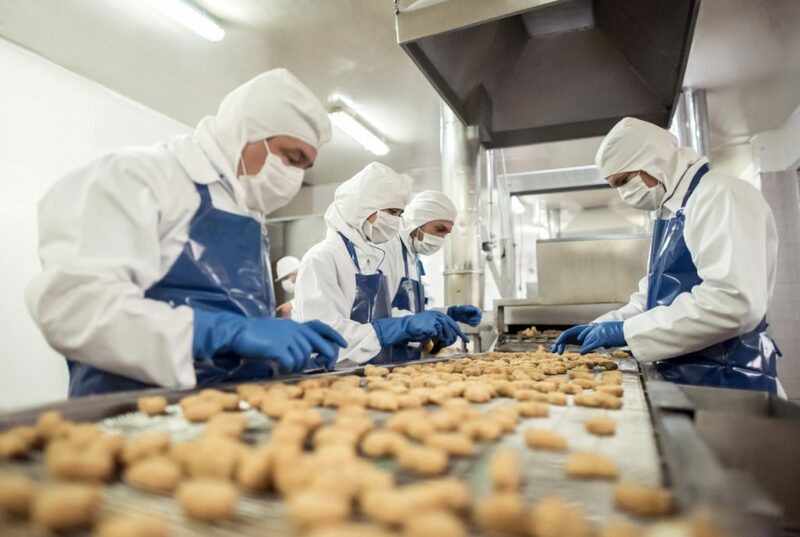 With such a diversity of factors to consider in each and every element of a food processing plant, there is a checklist of criteria that should be addressed when designing or upgrading a system to ensure that you choose a suitable component for the task. As mentioned earlier, hygiene should always be the number one consideration of any choice within the food industry. It’s important to understand exactly how the flow metering instruments will interact within the overall process, using a HACCP plan to identify and account for all worst-case scenarios. There is often a need to regard the installation of equipment too, with the physical environment and any constraining stipulations by the manufacturers of the equipment to ensure that the equipment works to its optimum level of efficiency. Along with the calibration and maintenance, the instrument life and repeatability of the process should match each other so that the device is sufficiently robust for its undertakings. This can then help calculate the life cycle cost of the equipment, which should also factor in a reasonable guesstimation for maintenance and running costs to ensure that the system is financially viable. The level of accuracy required will also potentially save money on the initial investment of the equipment if a high-level of precision is not necessary.